Raid Orders represent aggressive incursions and pillaging of enemy lands. They aim to disrupt enemy plans and drain him of precious resources. A Raid Order is resolved during the first step of the Action Phase by expending itself to remove one adjacent enemy Support, Consolidate Power, or Raid Order. Each player has two normal Raid Orders and one Special Raid Order. March Orders represent the movement of troops and ships across the lands and seas of Westeros. Only by assigning March Orders to units on the game board, can players take control of new areas and engage opponents in combat. March Orders are resolved during the second step of the Action Phase. When resolved, all units in the Order token's assigned area may march (i.e., move) to one or more adjacent areas. If marching units enter an area containing one or more enemy units, a combat ensues (only one combat, however, may be initiated for each March Order). Each player has two normal March Orders, one with a -1 Combat Strength modifier, another with a +0 Combat Strength modifier, as well as one Special March Order. Defense Orders represent the preparation of strong defensive positions. They grant a Combat Strength bonus to the defender of the assigned area (the bonus is indicated by the number printed on the Order token). Unless removed during the Action Phase (by losing a combat in the assigned area, for example), a Defense Order will contribute its defensive bonus against any number of attacks against its assigned area during the same game round. Each player has two normal Defense Orders, both providing a +1 Combat Strength modifier, as well as one Special Defense Order. Support Orders represent both logistical and martial assistance to forces engaged in nearby battle. Not only may support be granted to a player's own combat needs, but to that of another player. 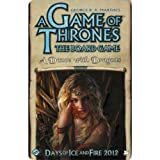 This makes the Support Order the fulcrum of negotiation and intrigue in A Game of Thrones: The Board Game. During the "Declare Support" step of combat, supporting units adjacent to the embattled area may add their combat strength to one of the two participants in the adjacent combat. Each player has two normal Support Orders, as well as one Special Support Order. 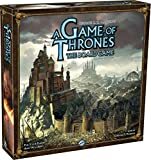 Consolidate Power Orders represent the garnering of local favor, the collection of tax income, and the harvesting of resources from areas under a player's control. They are the most direct way for players to gain Power tokens from the Power Pool. Consolidate Power Orders are resolved during the third step of the Action Phase. When resolved, the Order token is removed from the game board in exchange for gaining one Power token from the Power Pool, plus one Power token for each Power icon printed on the assigned area. Consolidate Power Orders placed on sea areas have no effect, but may still be placed. Each player has two normal Consolidate Power Orders and one Special Consolidate Power Order.